Just the glazing now to be added, when the paint has hardened. Just to prove that work on my line has not been abandoned (although recent progress has been sporadic) here are a few photos of the tunnel portals installed this week. The short tunnels pass under the high level line just beyond the southern end of the long viaduct. Following my usual methods, the parts are cast from resin and are heavy! The approach from main junction station end has staggered portals (the high level line crosses the main line diagonally) an arrangement which is used on British lines, although was never common. The tunnel "liners" still need to be added, as well as the enclosing "earthworks" (and the rampant ivy and other detritus need clearing away)! Other works to be completed before any serious "running" can take place are the pneumatic installation to operate the pointwork (about half the pipework has been installed so far....there are around 45 actuators which have been fitted) and the turntable which is now in situ (courtesy of Roger "bolingbroke") but needs the operating parts to be finished off. Photo : Mark amidst the devastation! After a Summer of family "disruptions", which led to cancellation of previous arrangements, I finally (having been spurred on by Mark Thatcher) got around to attacking the overgrown trees and shrubs which had all but buried the tracks. 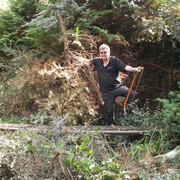 Armed with chainsaw, bow saw and tree loppers, Mark got stuck in, furiously attacking and felling offending foliage, while I cleared up the debris. Still a lot to be done but Mark has threatened to return in a week or so and continue the massacre! Current plan is to have a "Grand Opening" in the late Spring (only 8 years late!) and another GTG later in the Summer. There will be at least one "proving" session before the inauguration to ensure the complex layout and systems are working properly. The "Grand Opening" will be by invitation (buffet, drinks, music...probably live.... included) with a guest to make a speech and "cut the tape" but numbers will have to be limited since it is 16 years since we retired and sold our hotel and we are now out of practice in catering for large numbers! Fortunately, neighbours have already volunteered to help... including catering and providing the live music. Nearer the time, when dates have been "firmed up", I will invite members to apply for invitations.